A Christmas Carol as told by Santa Claus. What do you think of it? Merry Christmas! Yesterday was a great day. We made lots of toys. We are almost done making toys for the year. Soon we will load them all into my sleigh. When we were done, I ate dinner with Mrs. Claus. After dinner, it was time to relax. Mrs. Claus went to the kitchen to bake some cookies. I went to my library to read a Christmas book I love: A Christmas Carol by Charles Dickens. I still have my very first copy (that’s where all these photos came from)! Have you ever read A Christmas Carol? There are some very sad moments in it. It has some very happy moments too. And there is also ghost! But, do not worry. They are not scary ghosts. It all happens on Christmas Eve, and it is about a man called Ebenezer Scrooge. That is a funny name, isn’t it? Jacob Marley’s ghost visits Scrooge to warn him. Scrooge has lots of money, but he is also very mean. He is not happy, and he does not want other people to be happy. 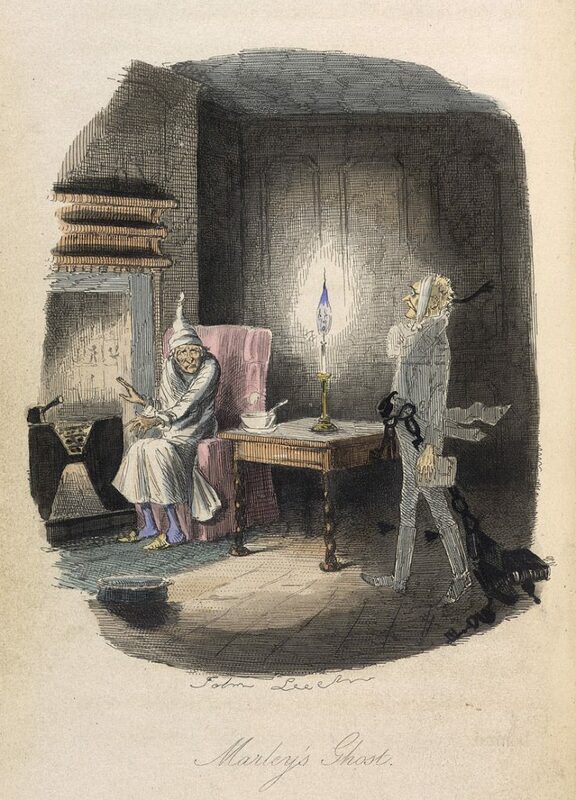 In A Christmas Carol, the ghost of Scrooge’s old business partner visits him to warn him about being greedy and selfish. Scrooge is then visited by the Ghost of Christmas Past. The ghost shows Scrooge some things that happened in the past. Scrooge was happy as a child. He grew up and had lots of good things, but then he got greedy. Scrooge wanted money so much that he lost all his good things. He became very sad. I try to be happy with the things I have. That is a very good lesson. Do not be sad for what you do not have. Be happy with what you do have. The next ghost is the Ghost of Christmas Present. The ghost shows Scrooge all the people in his life. They do not have much and are struggling. They have no money and no food, but they are trying their best to be happy, even though some of them are very sick. When I read this part, I always think that you do not need money to be happy, but if you do not have enough money for food and medicine, then you can get very sick and unhappy. The last ghost is the Ghost of Christmas Yet To Come. This ghost shows Scrooge what will happen to him if he keeps doing the same things. He will have no friends, and no one will ever remember him. This part is sad, but it is telling us that we should not be greedy. We should try and help other people. What happens next is the best part. Scrooge realizes that he has time to change, and he does. He becomes a good person and helps other people. Scrooge helps lots of people and has lots of friends. I think that the real lesson of A Christmas Carol is that it is never too late to change who you are. There is always an opportunity to help people. P.S. Can you think of a time when you helped someone? Is there something you are planning to do this Christmas that would help someone? You can click here to tell me or, scroll down to see what other people think it might be. I help people all the time. The best time I helped someone was when I gave them $50 dollars to a stranger I didn’t even know and will never see again. Hey I hope you have a Merry Christmas in the North Pole and I hope you are doing fine and make sure to ride carefully. Previous PostPrevious New Games for the North Pole Olympics! Come play with Santa’s elves! Next PostNext Santa’s elves get up to mischief. Read what they wrote here!